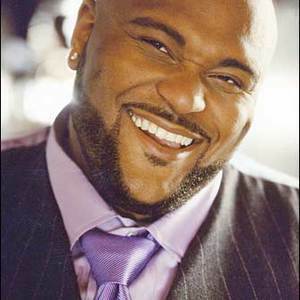 Christopher Ruben Studdard (born September 12, 1978), best known as Ruben Studdard, is an American pop, R&B, and gospel singer. He rose to fame as winner of the second season of American Idol, beating out Clay Aiken. Studdard received a Grammy Award nomination in December 2003 for Best Male R&B Vocal Performance for "Superstar." In the years following Idol, Studdard has released four studio albums, including his most recent disc, 2009's Love Is. In the years following Idol, Studdard has released four studio albums, including his most recent disc, 2009's Love Is. Partway through the second American Idol competition in early 2003, guest judge Gladys Knight christened corpulent crooner Ruben Studdard a "velvet teddy bear," a nod to his smooth, Luther Vandross-styled voice and his Barry White-sized girth. The nickname stuck, since it captured the persona of the 25-year-old native of Birmingham, Alabama, who had unexpectedly become the front-runner in the televised talent show. Surrounded by skinny kids emulating Kelly Clarkson and Justin Guarini, the two singers who had dominated the previous American Idol season in 2002, Studdard stood out with his massive frame, winning smile, mellow voice, and trademark jerseys bearing the number 205, the area code of his hometown. That hometown looms large in Ruben's background. The son of two teachers, Studdard was born in Birmingham on July 14, 1978. He sang at his parents' Baptist church as a child, but it wasn't until college that he seriously pursued music. Abandoning a promising career in football that would lead to an athletic scholarship at Alabama A&M University, he decided to switch his major and study voice at the school, eventually graduating with a degree in 2000. He then launched his professional career as a singer for Just a Few Cats, a Birmingham-based jazz and soul band. During 2002, Ruben joined one of the group's backup singers at an audition for the second American Idol, making the first round of cuts at his local audition, then winning himself a slot on the national television program. Studdard made a big impression from the start. Where most of his competitors were pop star wannabes hungry to win the competition, Ruben was quiet and exceedingly laid-back, impressing audiences and judges alike with his large voice and easy confidence. He soon climbed to the top of the pack and stayed there throughout the show, only once being voted into an elimination round. By that point, American Idol 2003 had turned into a horse race between Studdard and Clay Aiken, a skinny, geeky kid from the South whose appearance and taste were perhaps the polar opposite of Ruben's. Like many horse races, this one ended in a photo finish, with Ruben beating Clay by a few thousand votes in May 2003. Within a month of the show's completion, Ruben's first single, "Flying Without Wings," was released concurrently with Clay's "This Is the Night," a clever release scheme designed to keep the competition alive. Aiken beat Studdard to the top of the charts, and shortly afterward, it was announced that the proposed joint release of their debut albums would be delayed, with each album released separately instead. As Aiken rode a wave of popularity that eclipsed Studdard's, Ruben worked frenetically -- recording his debut, touring with his American Idol cohorts, filming a cameo for Scooby Doo 2: Monsters Unleashed, and suing 205 Flava Inc., the company that made the jerseys he famously wore on American Idol, claiming that the clothes makers illegally profited from his image. 205 Flava Inc. countered that they paid the singer $1,000 to wear the jerseys on the show during the competition, and presented checks written to Ruben's brother and manager on MTV News to support their claim. As Ruben worked, his album's release date kept getting pushed back; originally slated for an August release, the album was first rescheduled for October, and then postponed to November. Studdard's recording sessions boasted a variety of producers and collaborators, including Fat Joe, Missy Elliott, and R. Kelly, whose names were leaked to the press during the studio process in an effort to shore up Ruben's hip-hop and R&B credentials. When the finished product, Soulful, was finally released on December 9, 2003, it didn't boast either the highly touted Missy or Kelly tracks (though Fat Joe made the cut), but it did display a distinct hip-hop-flavored R&B bent, which stood in contrast to the pop-oriented efforts by such American Idol contestants as Clay Aiken, Kelly Clarkson, and Justin Guarini. Sporting two Top Ten hits, the album quickly went platinum. The gospel album I Need an Angel followed one year later, featuring collaborations with contemporary gospel icons such as Bill Gaither and Walter Hawkins. Although the album sales failed to approach those of Studdard's debut, I Need an Angel did fare well on the gospel charts. Even so, Studdard returned to his urban roots in 2006 with an aptly named third album, The Return, which featured such contributors as Scott Storch and Ne-Yo. Lead-off single "Change Me" topped the urban contemporary charts that same year, but The Return proved to be the slowest selling album of the singer's career, prompting J Records to cancel his contract in 2007.